Lead magnet landing page created in ConvertKit for Executive Coach Jason Hartanov for his Extreme Productivity ebook. We created the webinar registration page for our free About page workshop in Click Funnels which is currently converting at 53%. The landing page targets female entrepreneurs who are at the beginning stages of their business and who are DIY-ing their website. 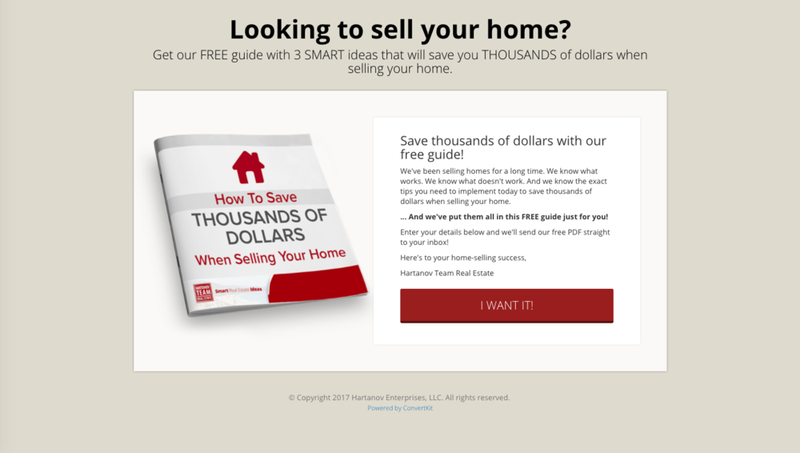 Lead magnet landing page created in ConvertKit for Team Hartanov Real Estate company inviting home sellers to download his free guide. We created the sales page for my free About page workshop in Squarespace which is currently converting at 8%. As with the webinar registration page, we're targeting female entrepreneurs who are at the beginning stages of starting their business and who are DIY-ing their website.